Details: Mexico 86. World Cup in Mexico. 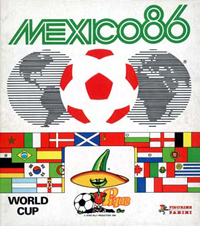 The Sticker Collection "Mexico 86" includes 427 stickers, each one measures mm 49x65. The album has 48 pages. Each packet contains 6 stickers.